I am writing to invite you and your organisation to join an important new initiative. Apologies for any cross-postings. 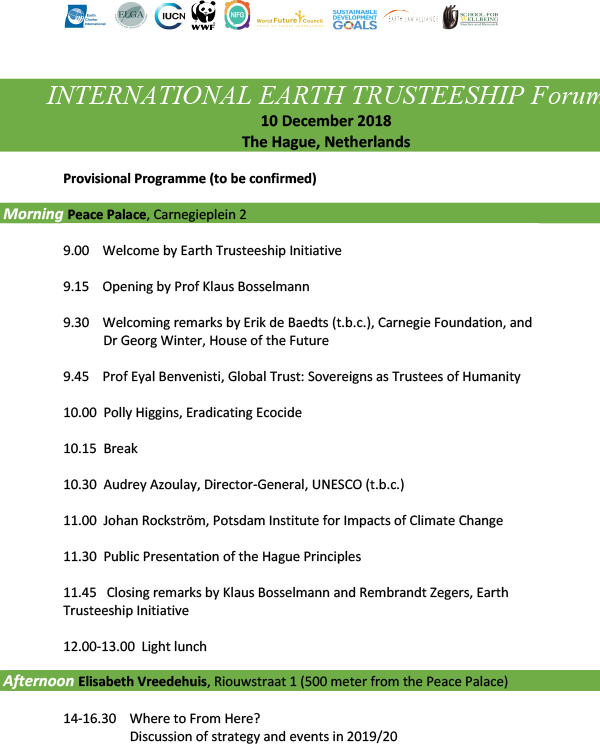 On 10 December 2018, the “Hague Principles for a Universal Declaration on Responsibilties for Human Rights and Earth Trusteeship” will be launched at the Earth Trusteeship Forum in the Peace Palace, The Hague, Netherlands, to mark the 70th anniversary of the Universal Declaration of Human Rights. declaration and how you can endorse it. You can also find the provisional programme for the 10 December Forum there and, if interested, register your attendance. 3-7 November 2019 in Bangkok, Thailand : 10th WEEC 2019, Local Global Connectivity.